eBay Classifieds has signed a deal with adMarketplace to power advertisements that run on its classifieds U.S. search services in an effort to compete with Craigslist. The site now serves 98% of the sponsored ads on mobile and tablet devices through the programmatic advertising marketplace. Google continues the fight to hold onto on-site search market share, losing search business on publisher sites to adMarketplace. It doesn't appear that the Mountain View, Calif. company will allow advertisers to see individual campaign data any time soon, which would allow advertisers to optimize campaigns for better results and return on investments. Advertisers using AdSense see the overall performance of the search network per category. For eBay Classifieds, moving from Google to adMarketplace drove up click-through rates by 10% across the sites during the past six months, and experienced 49.8% increase in eBay Classifieds' yield as measured by effective CPM. The increase in performance comes from adMarketplace's willingness to share individual traffic-source data per campaign running on the site. Advertisers can see the number of clicks, average click-through rate, average cost per click, and conversion rate. If Google changes its policy and agrees to show the data, "it would put us on an even playing field," admits Vince Meyer, adMarketplace vice president of business development. "It also means that Google would become much more transparent on the margins they gain from traffic." eBay's adMarketplace partnership remains one in several the company made to strengthen its position against Craigslist and others. The company recently announced a deal with Rewarder, an online marketplace that enables users to buy or sell their expertise. Rewarder allows eBay Classifieds users to post "Wanted" ads, rather than "For Sale" ads to help find items or expertise across several eBay Classifieds categories. 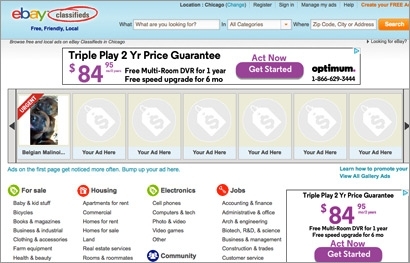 Launched in 2007, eBay Classifieds marketplace supports free ads in a variety of categories like pets, motors, for sale, housing, jobs, and services. The listings are available in 272 regions across the United States, and more internationally like Mexico. In January, eBay acquired Vivanuncios, a Spanish-language classifieds site in Mexico owned by W3 Ltd. The site receives 15 million visits monthly and had more than half a million published ads in the fourth quarter, 2014. Since then, the eBay Classified Group retired the iBazar brand in Mexico, migrating users to Vivanuncios.